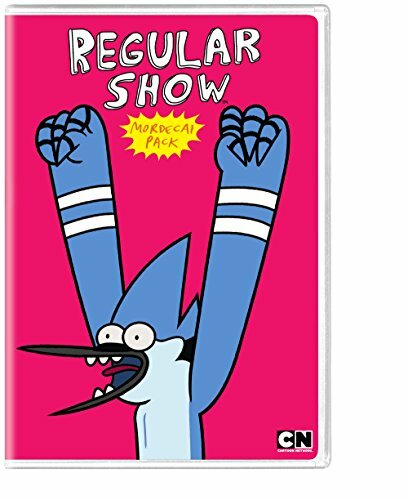 This January, Cartoon Network's beloved blue jay takes the spotlight in the all-new DVD, Regular Show - Mordecai Pack ! Packed with 16 hand-picked, Mordecai-centric episodes from the Emmy® Award-winning animated comedy, Regular Show - Mordecai Pack follows everybody's favorite slacker blue jay, his best friend Rigby and the rest of the gang on their extreme and surreal misadventures. Created by J.G. Quintel, Mordecai Pack follows two best friends and park groundskeepers, Mordecai and Rigby, a blue jay and a raccoon whose attempts to escape their everyday boredom take them to fantastical – and sometimes unintended – extremes. Maintenance duties for Rigby and Mordecai are just dull enough to somehow propel the pair into different wild shenanigans each episode. Their boss, the gumball machine Benton, does not enjoy having to manage their antics. However, Rigby and Mordecai's insane escapades often delight Pops, a talking lollipop, who has spent his entire life in the park. Since its September 2010 debut, Regular Show has solidified itself as one of Cartoon Network's most popular series, consistently posting ratings that are anything but regular. During its fifth season on the network, Regular Show ranked as the top show in its time slot among boys 6-14 and kids 6-14, according to Nielsen Media Research data. New episodes from the sixth season of the series are currently in premieres on Thursday nights at 7:30 p.m. (ET/PT) with multiple replays throughout the week. Cartoon Network will support the release of Regular Show - Mordecai Pack with a kid-focused marketing campaign utilizing broadcast advertising on Cartoon Network, as well as a comprehensive online campaign featured on CartoonNetwork.com and engagement with the show's nearly 6 million Facebook fans. Cartoon Network (CartoonNetwork.com) is regularly the #1 U.S. television network in prime among boys 6-11 & 9-14. Currently seen in 97 million U.S. homes and 194 countries around the world, Cartoon Network is Turner Broadcasting System, Inc.'s ad-supported cable service now available in HD offering the best in original, acquired and classic entertainment for kids and families. In addition to Emmy-winning original programming and industry-leading digital apps and online games, Cartoon Network embraces key social issues affecting families with solution-oriented initiatives such as Stop Bullying: Speak Up and the Move It Movement.